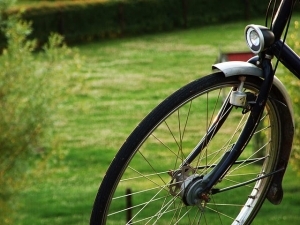 The Free Bike Program and the Repair Voucher Program aim to empower the local community by supplying a bicycle or the parts needed to repair a bicycle at no cost. Applicants may use the bicycle for personal mobility such as transportation to work, family or groceries, or for exercise and to maintain a healthy lifestyle. Applicants who do not have a bicycle can apply for the Free Bike Program by filling in the Application Form and acquiring a letter of referral from a local social service agency or community organization. Qualified organizations include: welfare and employment offices, Delaware DHSS offices, food banks, shelters, school nurses, and churches. The letter of referral should be on the organization’s official letterhead and explain why the applicant needs a free bicycle. Once the application form and the letter of referral are delivered or emailed to Newark Bike Project, NBP volunteers select a bicycle that is suitable to the applicant’s needs and carry out repairs if necessary. We aim to hand over the bike within one month of the application. Application forms are also available for pickup at NBP during shop hours. Applicants who have a bicycle but need a repair can use the Repair Voucher Program to repair the bicycle during the NBP Open Shop nights at no cost. To use the Repair Voucher Program, applicants only need a referral form from a local social service agency or community organization (no application form is necessary). After bringing the bicycle and the referral letter to NBP, applicants can repair their bike and all costs (e.g. basic bicycle parts) are waived. Bicycle parts used must be approved by the NBP shop manager on duty. If you have any questions, or if your social service agency or community organization wants to join the Free Bike Program and Repair Voucher Program, email us at info@newarkbikeproject.org.